On Monday, March 24, the eighth graders presided over Westminster’s Third Annual Constitution College. This is the culminating event of the eighth grade history project and the students’ overall study of this founding document of our nation. In the weeks leading up to this event, each eighth grader prepared a Power Point presentation on his assigned aspect of the Constitution, such as the legislative branch, checks and balances, or amendments 13-15. In addition, each student crafted a “mini-assessment,” or a little quiz designed for a seven or eight-year-old student to take after hearing the presentation. All of these student-written quizzes were compiled into a workbook. This past Monday, the eighth graders delivered their presentations to Westminster’s second grade class. 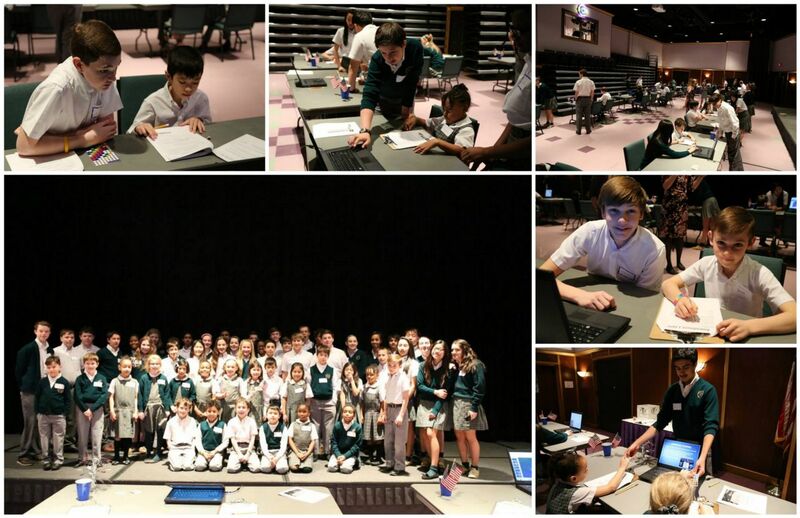 The eighth graders were positioned at individual stations, and each second grader came to each station for a five-minute period during which the eighth grade student delivered the Power Point and administered his quiz page in the workbook, guiding the second grader through it and checking his work at the end. The morning’s festivities also included a cookie and juice reception over which the second and eighth graders bonded. All of the participants enjoyed the experience immensely, and the eighth graders felt that they truly became experts of their assigned material, agreeing with the old adage that the best way to truly understand a topic is by having to teach it to someone else.